LinkedIn has lots of potential uses, depending on who you are, what you do, who you want to meet, where you're located, etc. But just what are the typical business functions most people say LinkedIn has helped them with? And as you can see in this chart, all other features are perceived as much less helpful. 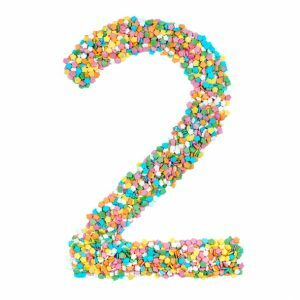 Here are some simple strategies and techniques you can use to get significant results for your business and career with these two LinkedIn features. Advanced People Search. The Advanced People Search filters will help you quickly and easily search LinkedIn's over 600 million member database and zero in on your target audience. Improve your skills at using the Advanced People Search feature, and your LinkedIn ROI will go through the roof. Company page search. If you know the name of your target companies (for anything from sales to job seeking and everything in between), simply type the name of a company in the search box at the top of your home page. When your target company shows up in the search results listing, click that entry, and LinkedIn will take you to their company page. On the company page, you will see details about the company's products, services, markets they serve, job openings, contact information, and shared updates. If you click See all [Number] employees on LinkedIn, you'll get a complete list of all their employees who have LinkedIn accounts. Then you can use the Advanced People Search filters to uncover the exact people you're trying to find. Advanced People Search. Place your cursor in the top search box and select Search for People. Next, choose All Filters, and enter the name of a company you used to work for in the Past Company filter box. Then enter the name of the department you used to work in (e.g., marketing, finance, etc.) in the Title box, and you'll get a list of most of the people you worked with at the company. Hopefully contact with one or more of those people will lead to your next big sale or job opportunity. Company alumni groups. 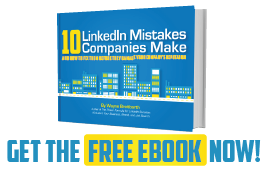 Some of the larger national and international employers have strategically set up specific LinkedIn groups for past employees so the company can maintain a positive relationship with them. You may also find unofficial company alumni groups that could open the door to tremendous networking opportunities. To find them, type the name of the company in the search box and add the word alumni. Next, click the down arrow next to More, and then select Groups. University Page. 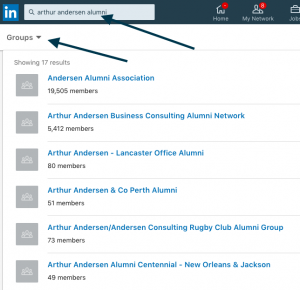 Most people have warm, fuzzy feelings about their alma mater and thus are more likely to consider doing business with fellow alumni—and it's easy to locate them with this powerful LinkedIn feature. 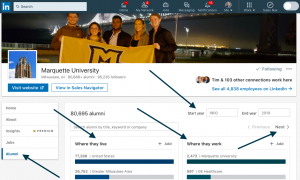 Enter the name of your college or university in the top search box, and it should then appear in the list LinkedIn displays. Once you click your school's entry, you'll land on their University Page. Select the Alumni tab. Then use all the great filters, including Start year and End year, to get the perfect list of fellow alums. It's just that simple. University alumni groups. 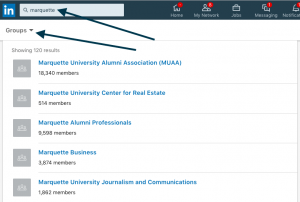 Find, interact, and connect with people who are members of official and/or unofficial LinkedIn groups related to your university. 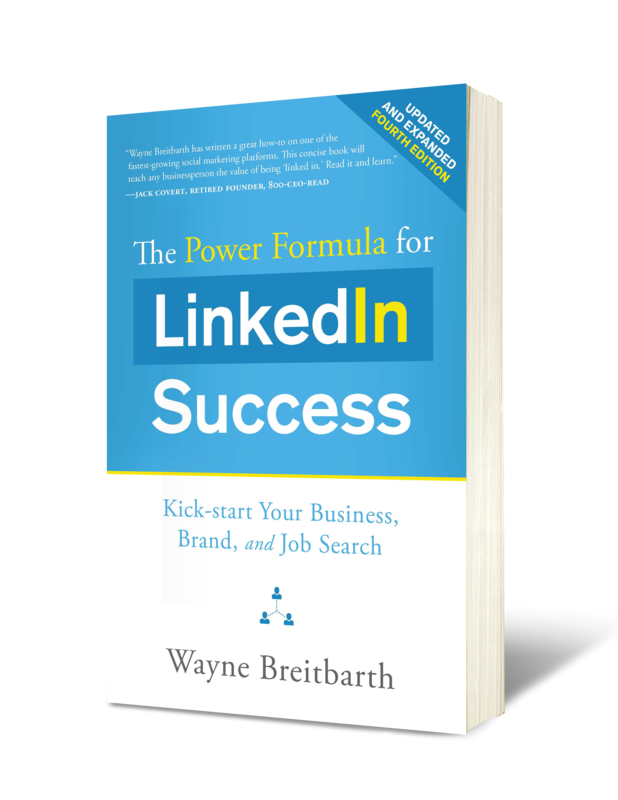 Get busy and use these powerful LinkedIn features to research people and companies and reconnect with past business associates and colleagues, and you'll quickly see your business and career begin to soar. If you'd like me to help you formulate your 2019 LinkedIn plan, sign up for one of the four to six personal sessions I fit into my schedule each week. These consultations are specially priced at $197. Book your session here. I will share my computer screen with you during the call and send you a marked-up copy of your profile prior to the call. Whether you’re using LinkedIn to find your next high-impact customer, raise your organization’s profile, or land the job of your dreams, this session is for you. There are limited spots available, so don't delay. Book your session today by clicking here.